Search.hidemysearch.com is not one of these trustworthy search tools developed to serve users well and improve their browsing experience. It is a typical browser hijacker, instead. According to experts analyzing malicious software, this search tool should be placed in the browser hijacker category because it hijacks all browsers. It seems to be compatible with Internet Explorer, Google Chrome, and Mozilla Firefox. Not all the settings are changed by Search.hidemysearch.com on these browsers. It only appears in the place of a user’s homepage and search tool. That is, it hijacks browsers’ settings. It is one of the main reasons Search.hidemysearch.com is called untrustworthy. 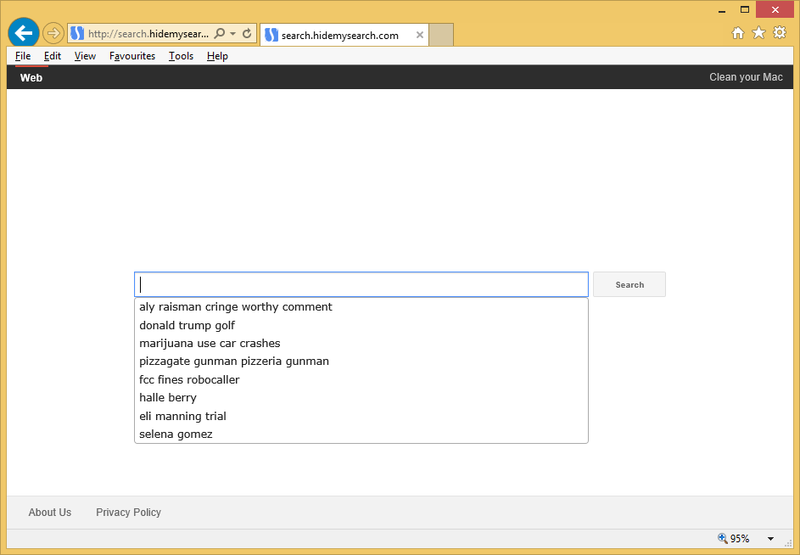 Unfortunately, it is not the only reason you should go to uninstall Search.hidemysearch.com from your browsers. If you do not go to delete Search.hidemysearch.com soon, you might allow malware to enter your computer. Also, privacy problems are unavoidable as well. Why should I go to remove Search.hidemysearch.com from browsers? There are several reasons why we do not consider the presence of Search.hidemysearch.com a very good idea. First, it is a typical browser hijacker which you see because it has illegally changed your browsers’ settings. Second, using it as a default search tool is not recommended also because it displays advertisements. You will see them only if you use this search engine to search the web. These ads cannot cause any harm if users do not click on them, but, unfortunately, they usually do not know about their presence and click on all search results they see opened for them. Those users risk landing on a page with malicious software – it might quickly enter their computers and cause serious harm. Additionally, they might be taken against their will to websites which only seek to get personal details. For example, they might try to convince users to provide this information by asking them to take a survey. If bad people manage to get personal details about users, they will surely sell this information. It might even end up in the hands of cyber criminals. You can protect your privacy by implementing the Search.hidemysearch.com removal today, so we recommend doing this as soon as possible. Where does Search.hidemysearch.com come from? Bundling is one of the most popular methods used to distribute browser hijackers. If you are sure that Search.hidemysearch.com has appeared on your browsers not because you have set it willingly, it must have entered your PC bundled too. It is not always easy to prevent threats which travel in software bundles from getting inside the system, so experts say that users must use security applications. Install one right after the Search.hidemysearch.com removal. How can I remove Search.hidemysearch.com? There are two ways to delete Search.hidemysearch.com from browsers. You can erase this dubious search tool either manually or automatically. If you are interested in what we think, you should get rid of it automatically because it seems that you do not know much about the removal of browser hijackers – you are reading this article. You will need a reputable malware remover to erase this infection automatically. You can get one from the Internet.